If your searching for a cool d20, you’ve come to the right place. 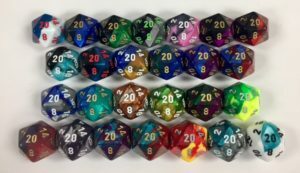 We are proud to stock a large selection of cool and unique 20 sided dice. We hope that you can find just the right d20. The dice below are some of our top selling 20 sided dice. All dice orders over $20 ship for free and we take pride in our fast and efficient service. If you can’t find that cool 20 sided dice that you were searching for, let us know and we will do our best to expand our inventory of dice.